Following the final closure of Stardust International Raceway in 1971, plans were developed for a new racing facility in Las Vegas: the Las Vegas Speedrome. Located in the far northeast corner of the Las Vegas Valley, the Speedrome consisted of a road course and drag strip, opening in 1972. Alex Rodriquez leased the facility from the City of Las Vegas, and added the 3/8-mile short track in 1985. Ralph Engelstad of the Imperial Palace purchased the track in 1989, renaming the facility Las Vegas Speedway Park. Engelstad partnered with William Bennett of the Sahara Hotel and opened a new $72 million superspeedway on the site in September 1996. The first race at the speedway was on September 15 with an IndyCar event, which was won by Richie Hearn. A NASCAR Truck Series race followed in November. In December 1998, Speedway Motorsports purchased Las Vegas Motor Speedway from Engelstad and Bennett for $215 million. Veteran motorsports publicist Chris Powell was named the speedway's president and general manager and still holds that position today. The Winston No Bull 5 Million Dollar Bonus was held at the track from 1999 to 2002. Jeff Burton won a million dollars in 2000 and Jeff Gordon won the bonus in 2001. Burton and Sterling Marlin were not eligible in 1999 or 2002. The drag strip was relocated into the current The Strip at Las Vegas Motor Speedway, while the old drag strip and road course was rebuilt to the current outer 2.4 mile road course in use today. The 3/8-mile oval was rebuilt with a new pit lane and start-finish changed to the opposite side. During the 2004 and 2005 seasons, Champ Car also held races at the speedway, which were both won by Sébastien Bourdais. In 2006, plans were announced to reconfigure the track after the Nextel Cup Series race held in March, increasing the banking from the original 12 degrees to 20 degrees. This reconfiguration entailed "progressive banking" which increases the degree of banking on a gradient towards the outside of the track. This increased side-by-side racing. The speedway also constructed a fan zone called the "Neon Garage". This area has live entertainment, unprecedented access to the drivers and teams, such as viewing areas for fans to watch their favorite driver's car get worked on and talk to the drivers, and is home to the Winner's Circle. The speedway moved pit road 275 feet (84 m) closer to the grandstands, built a new media center and added a quarter-mile oval for Legends Cars, Bandoleros, and Thunder Roadsters, in the tri-oval area. On August 8, 2006, the newly reconfigured track reopened to stock cars. Kurt Busch, the 2004 NASCAR Cup Series Champion and Las Vegas native, became the first NASCAR Cup Series driver to test a stock car on the newly reconfigured track in his No. 2 Penske Dodge. The Truck Series race in September 2006 was the first NASCAR race run on the surface, with Mike Skinner being victorious. Jeff Burton won the first Nationwide Series race on the new surface in March 2007, taking a Monte Carlo SS to Victory Lane. The following day, Jimmie Johnson drove a Chevrolet to Victory Lane, capturing the first NASCAR Cup Series win on the new pavement, and for him the third straight year he drove to victory lane at Vegas. In March 2011, Insomniac Events announced that their largest rave festival in North America, Electric Daisy Carnival (EDC), would take place at Las Vegas Motor Speedway for the first time on June 24–26. More than 235,000 people attended the three-day event. The 2012 event was held June 8–10 with an attendance of 315,000 people. The 2013 event was held June 21–23 with an attendance of approximately 345,000 people. The 2014 event was held on June 20–22, and the 2015 event took place June 19–21. The twentieth anniversary EDC Las Vegas 2016 took place June 17–19, 2016; the 2018 version of the festival will run on 15-17 June 2018. Insomniac signed a ten-year contract with LVMS to host EDC through 2022. A third road course designed by Romain Thievin was added in 2012. The course is 1.4 miles (2.3 km) long with 11 turns and an 1,800-foot (550 m) straight. In late 2017, the drag strip was expanded to four lanes. Since 2018, NHRA's April meeting is held with four cars racing simultaneously. Starting in 2018, A second race weekend will take place at the track, taking the New Hampshire Motor Speedway's Cup Series and Truck Series fall weekend races. Also, both weekends will now be triple headers (Cup, Truck, and Xfinity Series), moving the October stand alone race for the Truck Series at LVMS to the spring weekend, and moving the stand-alone Xfinity race from the Kentucky Speedway to the fall weekend. The Cup race would be the first race for the playoffs (replacing Chicagoland Speedway), The regular season finale for Xfinity Series, and the second playoff race for the Truck Series. On October 16, 2011, the final race of the 2011 IndyCar season, the IZOD IndyCar World Championship, was held at Las Vegas. However, the race was halted by a horrific crash on lap 11 that involved 15 cars, some of which became airborne, and some of which burst into flames. The crash began when Wade Cunningham made light contact with James Hinchcliffe, but the situation turned into a big pile-up of cars. The crash forced the red flag to be waved almost instantly, due to the remains of the damaged cars and the amount of debris on the track. Four of the 15 drivers were seriously injured and taken to the nearby University Medical Center for treatment, one of which was two-time, reigning Indianapolis 500 winner and 2005 series champion Dan Wheldon, who suffered severe blunt force trauma to the head after his car flew into the catch fence. He was pronounced dead on arrival two hours later and IndyCar's officials formally decided to abandon the race. Instead of completing the race with 188 laps to go, the 19 drivers who were not involved went back out on the track and did a five-lap salute in Wheldon's honor. In December 2011, IndyCar announced that they would not return to Las Vegas Motor Speedway and that the future of IndyCar depended on what they would learn from the ongoing investigation of the crash that claimed Wheldon's life. The crash happened during the filming of an episode about IndyCar for the TV documentary series Nerve Center. The crash was shown in the episode. Starts 18 Jeff Gordon, Matt Kenseth, Dale Earnhardt Jr. The NASCAR timing and scoring use a length of 1.5 miles (2.4 km). This length was also used by IRL between 1996 and 2000. In their last race in 2011 Indycar remeasured track length to 1.544 miles (2.485 km). This is the result of the reconfiguration of the track. Between 2005 (old layout) and 2011 (new layout), no indycar race was held there. NASCAR still use the old length of exactly 1.5 miles for the reconfigured oval. The RE/MAX World Long Drive Championship was held here in December 2013. Tim Burke won the event. The track is the finish line for the 24th season of The Amazing Race broadcast on May 18, 2014. Dave and Connor O'Leary won the race. World of Outlaws first visited the Dirt Track in November 1996. It hosted both a spring and fall event from 1997 to 2006. Since 2009, the WoO races in spring only. The track record was set by Danny Lasoski in March 2004, with 13.719 seconds (131.205 mph). Red Bull Air Race World Championship has been running a round at the speedway every October since 2014. Electric Daisy Carnival (EDC), an electronic music festival hosted by Insomniac Events has been held at the speedway every year since 2011. Beginning in 2018, the NASCAR K&N Pro Series West will race at the Dirt Track. ^ "2012 Kobalt Tools 400 at Las Vegas Motor Speedway". about.com. ^ "EDC: 8 more years of Vegas". Neon Vision Entertainment. Retrieved 28 June 2013. ^ Jung, Carter (August 2012). "Exotics Racing at Las Vegas Motor Speedway". Road & Track. 63 (12): 22. ^ Kantowski, Ron (March 8, 2017). "Las Vegas Motor Speedway finally gets second NASCAR race". Las Vegas Review-Journal. GateHouse Media. Retrieved March 9, 2017. ^ "IndyCar race red-flagged after 13-car incident". autosport. October 16, 2011. ^ "Wheldon dies from injuries". autosport. October 16, 2011. ^ "IndyCar's 5-lap salute to Wheldon". reddit. ^ "IndyCar won't return to Las Vegas in 2012". usatoday. December 8, 2011. ^ "Las Vegas Motor Speedway at NASCAR.com". Retrieved 15 July 2018. ^ "2000 Vegas Indy 300". www.champcarstats.com. Retrieved 15 July 2018. ^ "2011 IZOD INDYCAR World Championships Presented by Honda". www.champcarstats.com. Retrieved 15 July 2018. 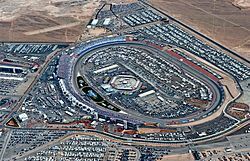 Wikimedia Commons has media related to Las Vegas Motor Speedway.